Can you name a few popular Eastern European dishes? I can. Schnitzel, beef goulash, bratwurst, cabbage rolls, perogies, blinis, beef stroganoff, borscht and vodka (yes I said vodka) It's certainly not an impressive list, especially coming from a self-proclaimed "foodie" but what's even worse is that I've had very little experience eating any of those dishes. I think unless your family is from Eastern Europe, it's safe to say that most Torontonians have very little exposure to Eastern European cuisine in general. Aside from the perogi, where we have a handful of popular downtown restaurants (i.e. The Saint tavern and Richmond Station) serving their take on the Polish dumpling, it's not an easy feat to find traditional or modern twists on Eastern European classics. So, does that mean we have to make a trip to Australia, Hungry or the Czech Republic for some wiener schnitzel? Nope. All you gotta do is venture north of Bloor to Yonge and St. Clair. You can do it, guys. 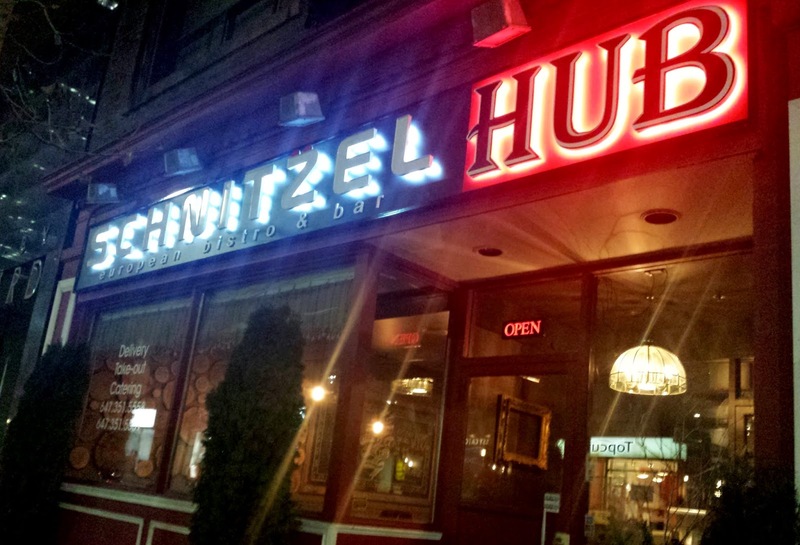 Aside from my meal at Hungarian restaurant Country Style on Bloor Street more than three years ago, Schnitzel HUB (Facebook: Schnitzel HUB, Twitter: @Schnitzel_HUB) is most likely the only Eastern European restaurant I've been to since then. I know, it's sad but did you know, my Country Style post is the third most popular post of all time on my blog? Amazing. With its first location in Thornhill, owners Yan and Rita Khalfon opened their second Schnitzel HUB at 1415 Yonge Street in November of last year. I visited the new midtown bistro during the Christmas holidays. Homey with a touch of modern, the two-month old European restaurant is elegant and much more formal in decor than expected (tablecloths are a rarity nowadays.) Not complaining though - it's a very nice change from the loud and crowded hipster joints. A spacious private dining room at the back of the bistro can comfortably seat forty people. Aside from its signature Eastern European plates, Schnitzel HUB also boasts a vodka bar (or "Kitchen Lab" as they call it) with 40 home-infused vodkas made with traditional family recipes. I sampled the following flight of house-infused vodkas (from left to right): Ligonberry, jolly rancher candy, honey + chilli + lemon, golgi berry, and horseradish. Some were sweeter than others (i.e. the jolly rancher candy) while some were a lot stronger in flavour (i.e. horseradish). Don't let the fruity / sweet flavour combinations or names fool you; these vodka shots are all pretty intense and are not for the faint of heart. For me, the highlight of the evening were the savoury courses. The Hungarian goulash was a great start to dinner. The traditional hearty stew with generous chunks of tender beef and vegetables had rich, meaty flavours with a slight spiciness from the sweet paprika. As for the perogies, I had to stop myself from eating them all. These warm, delectable plump dumplings with cheesy potato filling were hard to resist. They had a delicate dough that wasn't too thick so I could still taste the delicious filling inside (very important!) With 10 different schniztels on the menu, I decided to ask our server for some recommendations. He immediately offered us his favourite; the pan-fried breaded veal done in a mushroom, bacon and red wine sauce. What came was a massive schnitzel, and I'm glad it was huge because I really enjoyed it. The thin, golden brown coating was dry and crisp without being abrasive yet still had a good crust-to-veal ratio. Also, instead of falling away from the meat, the coating stuck onto the meat like how a good schnitzel should. The bed of spaetzle hidden underneath the veal was tender in texture and was a perfect accompaniment to the schnitzel. The not-so-good points of the plate: the sprig of rosemary garnish was unnecessary (just like the drizzle on the beets salad plate, very 70's), some of my vegetables were so roasted they were almost burnt, and I would've preferred sliced fresh mushrooms over canned mushrooms in the gravy. But you know what? I'll still order it again because the schnitzel was delicious. The desserts were average, perhaps I'm not one for sweet perogies. I thought the dumplings, which were filled with a sour cherry filling then lightly dusted with powdered sugar, didn't have enough sweetness to them, at least not enough to be called a dessert. I also prefer a sweeter dough (I think they use the same dough for both savoury and sweet perogies but I could be wrong). The crepe was decent but I personally prefer crepes with a less spongy and eggy texture.